Read the Aston Martin DB9 Coupe (2004 - 2012) car review by Auto Trader's motoring experts, covering price, specification, running costs, practicality, safety and how it drives. Aston Martin’s exquisitely hand-crafted grand tourer is both beautiful and accomplished. If you like your speed combined with style there’s little out there to rival it. 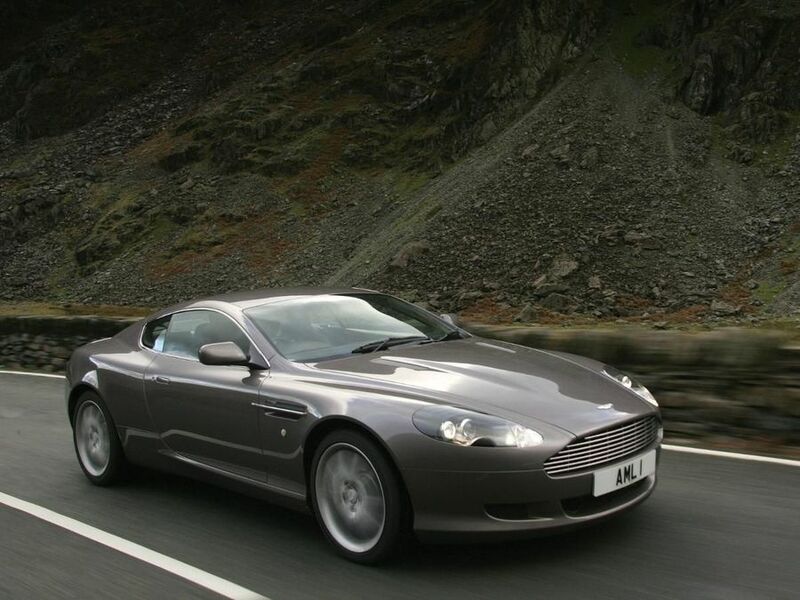 Few cars receive as much admiration as the Aston Martin DB9. Rightfully so, as it’s a sensational looking machine. Flowing lines neatly convey its power without being overbearing or brash. Classically proportioned with its long bonnet and muscular wings, the DB9 remains a head turner despite its advancing years – it was introduced in 2004. Minor styling tweaks in 2010 included a new grille, redesigned alloy wheels, altered headlamp bezels and clear rear light clusters.. Only the addition of the edgier DB9-derived Virage to the line-up lessens the DB9’s appeal. The interior follows the beautiful detailing of the exterior lines, and adds an architectural look and feel. The mix of metal, plastics and leather is well executed, as you’d expect in a hand-crafted car. From the way the doors open upwards slightly, to the fine comfort on offer from the leather seats the DB9’s interior feels special. It’s not the last word in user friendliness though, as the instruments are tricky to read when it’s bright and the stereo controls are a touch fiddly. However, the real Achilles’ heel is the sat-nav, which is hopeless. A classically proportioned 2+2, the DB9 might theoretically offer a pair of rear seats, but they’re for occasional use only. If you need a four-seat Aston Martin then the Rapide is a better choice. Accept the limitations and use those seats for luggage rather than passengers and the DB9 is a useful daily driver and occasional continent crosser. The boot’s a decent size, though access isn’t great and its shape makes soft rather than hard luggage easier to squeeze in. There’s useful door bins, a smallish glove compartment and cup holders should you need them. New for 2010 is the standard fitment of Aston Martin’s adaptive damping system. It constantly monitors the road to achieve the best balance between control and comfort. It works too, with the default Comfort setting delivering a supple ride quality combined with the sort of precision you’d expect in such a car. Switch those dampers over to Sport and the composure is lost, though that’s more to do with the state of our roads than the suspension itself. Finely balanced weight distribution and quick, nicely weighted steering only add to the DB9’s appeal. It’s unlikely you’ll ever feel short-changed by the DB9’s 190mph capability and 4.8-second 0-62mph time. What’s more impressive is the ease by which that performance is accessed. The optional Touchtronic automatic transmission provides smooth gear shifts and paddle-control should you want to take over. Manual cars are extremely rare, not least because much of the DB9’s appeal is its effortlessness and rounded performance. The 470bhp 6.0-litre V12 engine is strong at all times, though it produces its best – noise and performance – at high revs. At more sedate speeds it’s completely unflustered, making it a consummate all-rounder. Forget running the DB9 on a budget: it just won’t happen. Six-litre V12 engines like fuel and the DB9’s likes super unleaded at the rate of around 18mpg officially. In real word driving the fuel consumption will be greater, especially if you can’t resist using all its performance. Band M emissions means heavy road tax; servicing won’t be cheap, nor will insurance, tyres and other consumables. A decent 10,000-mile service interval is some consolation, but only a small one. The DB9 won’t ruin you, but it’ll never be cheap to run. The DB9 hasn’t got the best reputation for reliability, but it’s certainly improved since it was introduced. The problems typically centre around the tyre-pressure monitoring system and warning messages on the dashboard, while build quality on early cars wasn’t as good as it could be. It’s never going to be as reliable as a mainstream car, but it has improved markedly in recent years. Directional stability control, seat belt pretensioners and driver and passenger airbags are among the standard safety equipment in the DB9. It’s not been independently crash tested, but the DB9’s strong, extruded aluminium structure should provide excellent crash protection. Standard equipment levels are as high as they should be in a car at this price level, with climate8control, leather everywhere, electric seats and an excellent stereo system as standard. Where the DB9 is lacking is in the sort of radar-guided, lane-keeping, driver attention monitoring systems of some of its rivals – though arguably it’s better without the distractions. It feels worth the money you pay for it, though there’s lots of opportunity to personalise it should you have deep enough pockets. Few cars have such broad appeal, both in the way they drive and in desirability. Everyone appreciates Aston Martin, while everyone’s got an opinion on Porsche, Ferrari and Mercedes-Benz. A classically styled car that never feels anything less than special, the DB9’s only problem is the recent addition of the Virage to the range. It adds a bit more power, slightly sharper looks and dynamics and more standard equipment for about £25,000 more. And at this level of the market that extra isn’t going to matter, which suggests the DB9’s days are numbered.